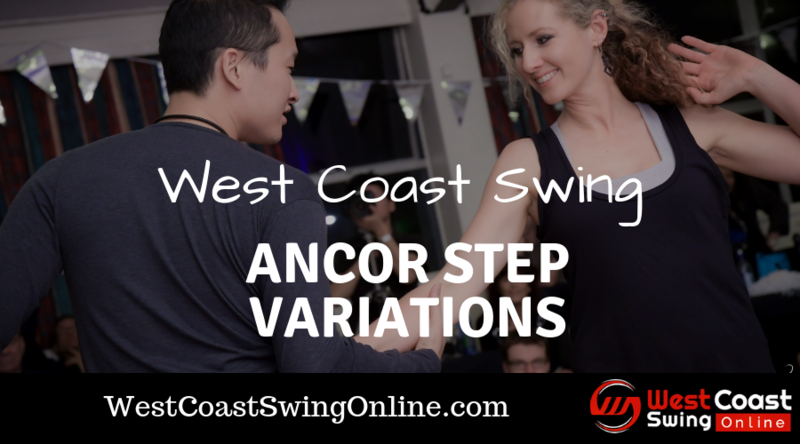 There are really only three ways to get into an anchor in west coast swing: you can step down the slot (i.e., away from your partner), you can turn to your right, or you can turn to your left. Each of these directions sets up your momentum for different anchor variations. The purpose of this drill is to become aware of these differences and to identify anchor variations that fit each situation. Because each partner is on the opposite foot and facing the opposite way, it will be easiest to discuss these variations in terms of moves that create the same kind of momentum, even though the follower will be rotating the opposite direction as the leader. The Drill, Part 1—Push Break: This version of the anchor occurs for both partners on a push break; for followers, it also occurs on whips, and for leaders it occurs on sugar tucks. In these situations, you are stepping linearly down the slot immediately before the anchor. As a result, it feels natural to keep a linear momentum for your anchor. A great anchor variation that uses linear momentum is a point behind on the first beat of the anchor, with the foot returning to 3rd foot position for the last beat of the anchor. To practice this variation, dance a push break either by yourself or with a partner. After beat 4, take your free leg behind you and press into the floor without moving your weight onto that foot. Then, collect the foot in 3rd foot position for a traditional end to the anchor. The Drill, Part 2—Underarm Turn: In the underarm turn scenario, the leader is rotating right in order to get back into the slot on the post, while the follower is rotating left. This situation occurs for a leader on any right side move (e.g., a whip or a barrel roll); for followers, any side pass or inside turn will set up this momentum. In these patterns, the free foot after the post (i.e., right for leaders and left for followers) is in a position to cross in front for the first part of the anchor before returning to a normal 3rd foot position on the last beat of the anchor. By crossing the first part of the anchor, each partner can make use of the rotational energy generated by turning back into the slot. For followers, this variation is especially useful for settling yourself as you come out of an inside turn because you can press into the cross in order to redirect yourself back to your anchor instead of having to freeze your rotation immediately in 3rd foot position. To practice this variation, dance an underarm turn either by yourself or with a partner. After beat 4, cross your free leg in front of your weighted leg and step or press into the ground for beat 5. Recover back onto leader’s left/follower’s right if necessary on the & of 5, and then settle into your 3rd foot position anchor on beat 6. The Drill, Part 3—Side Tuck: In the side tuck scenario, the follower is turning right at the end of the pattern while the leader is turning left. As a result, both partners are pivoting around their posting foot (left for leaders, right for followers). This situation occurs for leaders on any left side move, and for followers after any outside turn. Because the rotation happens around the posting foot, this scenario makes it incredibly easy to do a ronde with the free leg as you come into the slot. For this variation, practice doing left side tucks either by yourself or with a partner. As you step your 4, settle into that leg so that you can sweep your free leg around. Extend the free leg (leader’s right/follower’s left) and sweep around until you are facing your partner and your free leg is now directly to your side. Drag the free leg as you gather back into 3rd foot position and settle into the anchor on beat 6. Bonus Variations: For each situation, pick two or three anchor variations that are comfortable for you and that fit the momentum of your movement.